Shiri was a very special person. Gifted with beauty, joy, talent and goodness of the heart. 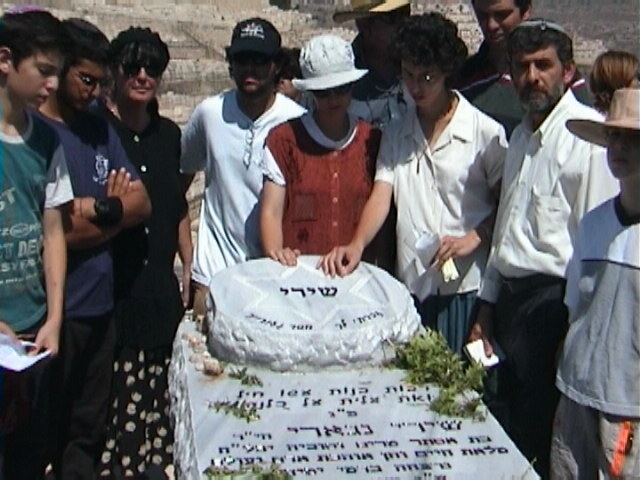 Shiri was a proud Jewish Israeli young woman. 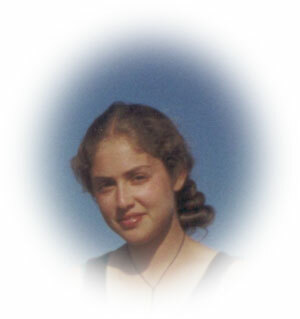 She was murdered on Tuesday, June 18th 2002 by a Palestinian suicide bomber on her way to work. You can contact Shiri's family at dvrnet@bezeqint.net. Sharon, Shelly, Shiri, Shay and Shahar. 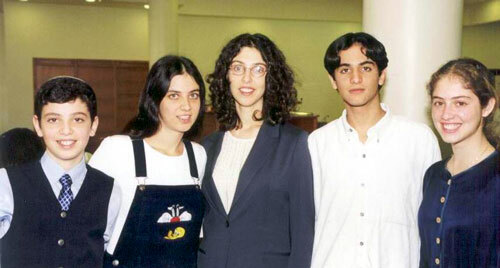 The 5 children of the Negari family before the morning of June 18th 2002. When we now call the 'Sh' names by their order, Shiri is missing. >I want to tell Shiris Family that altough I got to know Shiri just for ten days in Pucon, Chile, in these days she changed so many things in me, no older friend has ever changed. Since the first moment i knew her, I was certain that Shiri will be a true friend for me and so she was, and still is, I believe. Shiri and me were very different: I come from a jewish family in Mexico and made "aliya" five years ago. Even though i received jewish education, before I got to know Shiri, i had never met someone that is truly religious, someone that believes with so much love, honesty and inocence like Her. Shiri and me had a lot of long talks that lasted entire nights about faith, values, and other things, about our differences and similarities, never discussing, but trying to learn from each other. I learned so much from Shiri, a girl that knew how to give without ever demanding, that spread her love to the world, and knew how to take back the love from the world and turn it into light, a light that shined through her glaze, through her smile, and her singing. Spending a Shabat dinner with her was one of the most beautiful experiences I had in my trip, because she received this day with so much joy. 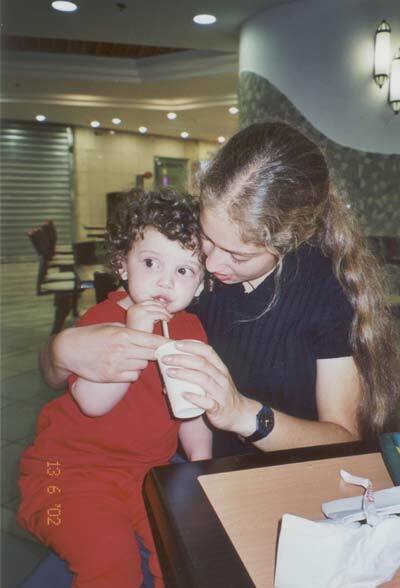 Shiri is very special to me and I love her dearly, I was waiting forward to meet her back in Israel. The world looks much emptier without her to me, and I hope she continues to look at the world with a smile from wherever she is, probably heaven. A few days after Shiri died, a young girl came to her family's house and told her parents a remarkable story. It appears that about a week earlier, Shiri ran into a girl who sat in a bus stop and cried because she didn't have the money to pay the bus fare. Shiri calmed her down, gave her 5 Israeli Shekels and while they were waiting for the bus to arrive, Shiri told the little girl about her trip to South America. When Shiri's friend from Chile heard that she was killed, he flew to Israel to comfort the family, as he promised Shiri - "in case something goes wrong". "She planted seeds everywhere she went" he said, and made us all cry when he described Shiri singing her family's Shabat songs every day on sunset. Shiri made a list of places she wanted to take her friend, but Shiri couldn't make it. We wanted to show him as much as we can of Israel in just 2 days - Just like shiri would like us to. 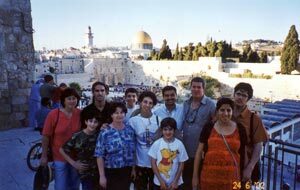 You can see us all taking a picture in the old city of Jerusalem.